Kycoo the Ghost Destroyer achieved a brief renaissance of sorts at the peak of the Chaos era, and now seems to be plummeting once again to relative obscurity. The reason for this, obviously, is the banning of Chaos Emperor Dragon, the most broken card in the game. Back then, the only hope of stopping him was to remove the fuel fodder through heavy use of Kycoo the Ghost Destroyer. Kycoo, by definition, is a whopping stud of a monster. He combines a great attribute with great stats and a great effect. Ironically enough, however, he shouldn't really be viewed upon as "side-board" material, but rather as a supplement to the main deck that can achieve numerous FORCE objectives at once. Advantage F/H: Kycoo provides two advantages in your quest for control of the game. The first is absolute mastery of the graveyard. This effect has been weakened (somewhat) by the ban of Monster Reborn, but it still limits plum choices of Premature Burial and Call of the Haunted. He also exhibits some elements of field control, though he'll quickly be smashed by the Blade Knight/Berserk Gorilla dominated environment. He remains decent at both, and one of the only true counters to Sinister Serpent. Best Draw for the Situation: Kycoo functions best in the mid to late game, where the heavy hitters are gone and all that's left is a clear path to your opponent's life points. See, he'll smash those spent Breakers, Tribes, and other sub 1800 cards with relative ease, as long as you protect him against the aforementioned Donkey Kongs. I still don't get why Berserk breathes fire, but that's just me I guess. Anyways, Kycoo is generally a solid enough draw. Attributes/Effect: Kycoo has very solid stats, except for a poor defensive rating that will suffer versus Book/Enemy quickplay abusers. He's also a Dark Type, helping him feed the Chaos graveyard, and he has a solid attack score mixed with two decent effects. The use of Dark Blade the Dragon Knight has hurt him somewhat, but he remains highly playable. Dependability: With all of the defenses floating around, it's become a lot harder to actually attack direct with this bad boy. However, don't forget 1800 is still a formidable force. The Bottom Line: Kycoo remains a solid monster. ++ Contributes to Field Control (somewhat), Enemy Disruption (somewhat). Now this monster is a spicy little spellcaster that you should sideboard some copies of. Unlike other choices, Kycoo actually IS able to shutdown some strategies, and at least throw a wrench in others. maindecking 1 Kycoo and siding the rest. Kycoo stops the most fearsome creature in all of advanced Yugioh! from even coming out. Period. Until he is destroyed/book of mooned, etc BLS can't even be summoned to the field. This is in addition to the graveyard manipulationg provided when Kycoo starts removing darks and lights from the graveyard, further hindering the arrival of any Envoys or Chaos Sorcerers. Kycoo is simply a great preventative measure to the current most game-breaking card in Yugioh! he's not mainstream everywhere. The fact is, strike ninja has a few weaknesses in Kycoo - one being the simple fact that Kycoo's 1800 Attack is slightly higher than the Ninja (who can't remove to 'disappear' when Kycoo is out on the field), and the other that Kycoo can so manipulate the graveyard by removing darks so that even an in-hand strike ninja seems useless. Just be wary of the Dimension Fusion. big threat (especially right after a painful choice, always very nice) from the graveyard means you won't be seeing it later in the duel with recursion cards like Premature Burial and Call of the Haunted, but the amount of resurrecting power involved with zombies is insane. Adding 3x Book of Life to the mix means you need to act fast to remove those big beaters, especially that Vampire Lord, and so Kycoo might be just the trick. New Exodia - This one seems a little farfetched, but actually, since Exodia now intends to win by grabbing all the pieces out of the graveyard at once, then if you can manage to somehow clear the field and get a swing in, removing a piece is equivalent to GG. I'm not so sure about this though, since even turbo-Exodia runs defensive measures and plenty of monsters, I'm only putting this out there as an option. I don't really think Kycoo is getting past all the jars, goats, thunder rulers, and even gravity binds that Exodia packs, but it's a noble gesture nonetheless. note that Kycoo has the 'magic number' range for 4 stars - 1800 will take out any and all of those 1500, 1600, and 1700 effect mons. But don't forget, Kycoo still can't touch any of the 'beatsticks' like Gorilla or Zombyra so if you intend on abusing him, back him up with some support like Sakaretsu Armor and Ring of Destruction. 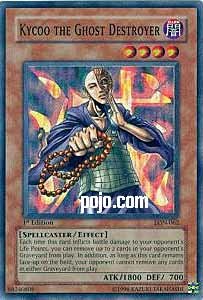 burn, ftk, and heavy beatdown.just toss this guy in for some added control. Traditional - 3.5/5 Well, two Kycoo were pretty prevalent maindecked in the times of CED and company, not to mention Monster Reborn and its affiliates. Advanced - 3/5 Kycoo is solid and is at least enough of a threat that your opponent has to worry about him - he's a good choice for a sideboard card. He's in everyone's side already -- if he isn't, he should be. Kycoo is anti-Chaos in one monster. Can't drop Chaos to the field with an opposing Kycoo out...and removes Chaos food every time he whacks for damage. 1800 ATK is great in today's metagame, except against those Beastdown decks (or decks running 3x Berserk Gorilla.) His Dark-type allows him to help Chaos as well -- a Chaos deck that screws over other Chaos, where do I sign up? Coin Flip You thought I wasn't going to do another re-review, eh? MUAHAHA! Anyway, today we have one of the best monsters of its time and in the game. This thing was a virtual "no-no" come DCR when we had stuff like, y'know, 1900's and all. Then comes IOC, and two valid points are raised to player's attention. First: "Oh crap, these chaos monsters are powerful. Hmm. Kycoo is a strong monster with a useful effect that weakens Call of the Haunted and other revival, kills Serpent and Witch, and prevents the chaos monsters from being summoned as well as removes the chaos food, preventing any summoning further on from taking place. I think I'll maindeck 3." Second: "Oh crap, these chaos monsters are powerful. Looks like a new era of chaos beatdown/control is arising. Kycoo is a strong addition to it as an 1800 attacker which prevents the chaos monsters from being summoned by the opponent, and is Witchable and a DARK, thus being Chaos food himself when he is invariably nuked by a Raigeki, or occasionally, Dark Hole in place. Which sort of takes the point away from him being invariably nuked. I think I'll maindeck 3." This very player was dq'ed from a tournament for running 6 Kycoo the Ghost Destroyers in his deck, but regardless, smarter players who were more capable of counting were BETTER OFF because of good ol' Kaiku the Turner of Souls. His stats make him a powerful monster, and his effect is best described as teh pwn. I think we all know what my opinion is of an optional, beneficial effect for you is when attached to an already good monster. That said, teh oober. Right now he has a more crucial spot in the metagame, though, and that's killing the 1700's people seem to like. Wanghu is an annoying one (albeit not as common as Enraged Battle Ox, who is the other). Personally, I'd run at least two in any beatdown deck if the meta is crawling with chaos. And, until BLS is banned, I'm still trying to make a point to squeeze them into my deck because they are a swiss pocketknife for the player. Removes targets for revival like CotH, removes cards like Sinister Serpent, and gravely injures the chaos player by stopping the card as it is drawn as well as acts as a monster capable of standing up to any 1700's in the average players lineup (which has recently been climbing). Since his last review back in 2003, this guy has only improved. He's easy enough to get that I shouldn't need to tell you how to get one. He's useful in sideboard and out, so I'll give him a general rating and a rating in the anti-metagame deck that seems to be becoming real popular. Who could ever forget good old Kycoo? Everyone loved the guy when he was released in Labyrinth of Nightmare because, before his errata, you could essentially annihilate your opponent’s entire Graveyard. Now, of course, you can only remove monsters; but there’s nothing wrong with that. Having 1800 ATK and being a solid DARK/Spellcaster also make Kycoo a nice choice. The Graveyard destruction is a great effect, even though he’s restricted to monsters only. It’s always good to remove your opponent’s Sinister Serpent before he gets it back, or his Jinzo before he can revive it. You can also remove those vital LIGHTs and DARKs before your opponent does to summon his Chaos monsters. Which brings us to Kycoo’s second effect: your opponent can’t summon Chaos monsters when he’s on the field. Isn’t that grand? Since he’s unable to remove from either Graveyard, he’s unable to remove those cards to summon BLS-EotB or, if you play Traditional, CED-EotE. They’ll just sit worthlessly in your opponent’s hand as he tries to get rid of your Kycoo who, all the while, will be removing those LIGHTs and DARKs your opponent can’t remove himself. Rentsy! His playability has gone down slightly in the Advanced Format just because he isn’t as necessary to stop Chaos, but he’s still very useful and certainly has a place in the often-overlooked Fiber Cycle Deck (based on removing opponent’s cards from the Graveyard and using Fiber Jar as often as possible, limiting your opponent’s options and potentially even decking him out). So run Kycoo – why not? Today’s card is Kycoo the Ghost Destroyer, one of the few 1800 ATK monsters that is still widely accepted as a good card AND is used. As already said, Kycoo has 1800 ATK, a number that, when he was new, made Kycoo a god. These days though 1900-2000 is all the rage for beatsticks, but Kycoo has managed to maintain a firm grip on the Acceptable Train. The reason for this is Kycoo’s effect, allowing you to remove up to two monsters from the opponent’s Graveyard when Kycoo does damage to their Life Points. This is a phenomenal effect because it takes away your opponent’s options, making cards like Premature Burial utterly useless due to no (if any) worthwhile monsters existing in their Graveyard to revive. Of course Kycoo’s current effect isn’t quite as great as it was when first released (which allowed you to remove ANY card from the opponent’s Graveyard, not just monsters), but Kycoo has found renewed uses in the last year with the release of the Chaos monsters. Because of Kycoo’s effect, those who lived in fear of Chaos had means of preventing the summoning of the Decks primary monsters by removing either Light or Darks form the Graveyad (whichever was less abundant there at the time). Kycoo was also a way of stalling the opponent because of his second ability, which prevents your opponent from removing cards in either player’s Graveyard from play. This effect would force your opponent to kill Kycoo before they could summon their CEDragon, and protect your own Graveyard from an opposing Kycoo. The glory days of Kycoo are sadly slipping away. With the banning of CEDragon in Advanced and the telltale signs of BLS following suit, Kycoo’s primary uses seem spent. Unless Dark Necrofear peaks in popularity after BLS’s imminent disappearance, Kycoo may become just a neat monster with a neat effect. But, we live in the present and Kycoo still has his uses, which are most commonly found in the Side Decks. Not the best of way to end a review but it works for me. Advanced: 3.5/5. Its uses aren’t as great as they are in Traditional but Kycoo can be useful. Traditional: 4.5/5. The bane (and ally) of Chaos is deserving of a high score. Art: 4.5/5. I’ve always like Kycoo’s artwork. sHecKii One of the most common sideboard cards along with Mobius the Frost Monarch right? Where the format tends to go towards Berserk Gorilla beatdown and Warriors, Kycoo seems to be a bit out-dated. I say 1 Kycoo MAX in the maindeck now because a) Chaos Emperor Dragon + Black Luster Soldier in a deck = best deck ever.and you needed Kycoo's maindecked to have a chance but now it's only Black Luster Soldier, b) you only need 1 hit with Kycoo to have him be effective, and c) It's probably one of the worst monsters against burner. Kycoo can be boarded in against the warrior deck, obviously chaos, and even earth beatdown. Actually, to make it simple, anything that deals with the graveyard (besides maybe boarding in against banisher of the light? dxP) Kycoo and his amazing effect is overshadowed by Berserk Gorilla's ability to smash EVERYTHING including Airknight Parshath and Blade Knight's ability to negate flip effects. I suggest trying Kycoo out main deck and if you don't like it, don't play him in the sidedeck.